I can’t find words to describe how spectacular it’s the taste of this sorbet, the cinnamon topping adds a unique flavor! I know! we are just in January and it’s cold, very cold, but over here we love ice cream, especially if it´s homemade. I made the recipe using an ice cream machine but you can do it without a machine. One of the most frequent problems when making sorbets, it’s that as soon as you freeze it, it becomes really hard like a solid brick of ice and loses the soft and smooth texture. I found a blog post “sorbet 101¨ at Zoe Bakes, in which she explains that the absence of sugar in our mix is what influences the sorbet to freeze completely, she gives several tips to prevent this problem which I recommend you to read on her blog before trying this recipe. I added 2 teaspoons of vodka to the sorbet mix as she recommended and it turned out pretty well. 1. Mix one cup of sugar with one cup of water and a teaspoon of vanilla in a saucepan until sugar is diluted over medium heat. 3. 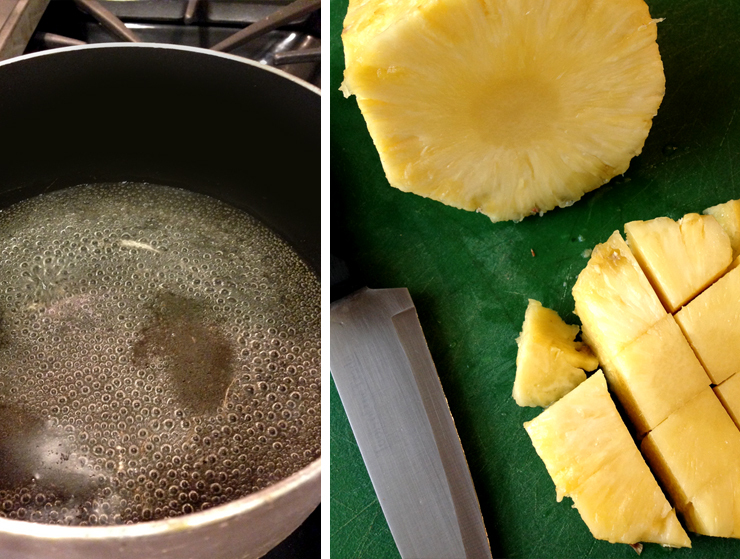 Blend the pineapple with half of the sugar mixture, then add the rest until it is all liquid. 5. Freeze the mixture for about an hour. 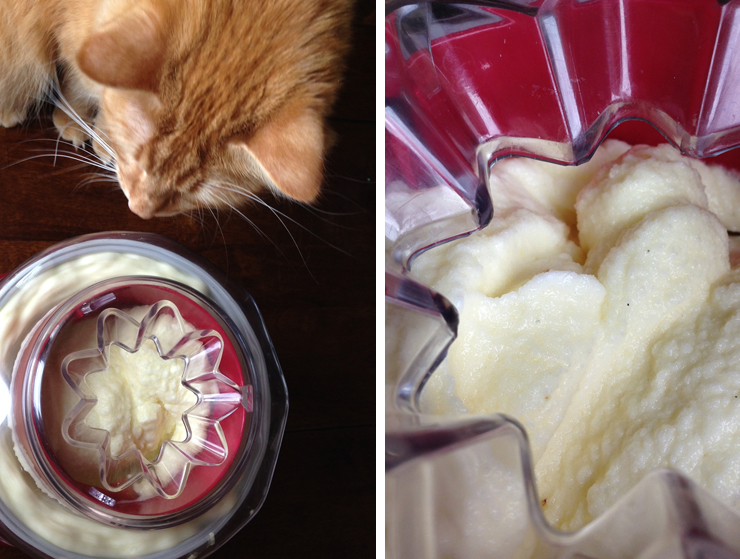 If you are not using an ice cream machine, mix the sorbet every hour until it is completely frozen. freeze the sorbet according to the manufacturer’s instructions. Sprinkle some cinnamon on top of the sorbet before serving. 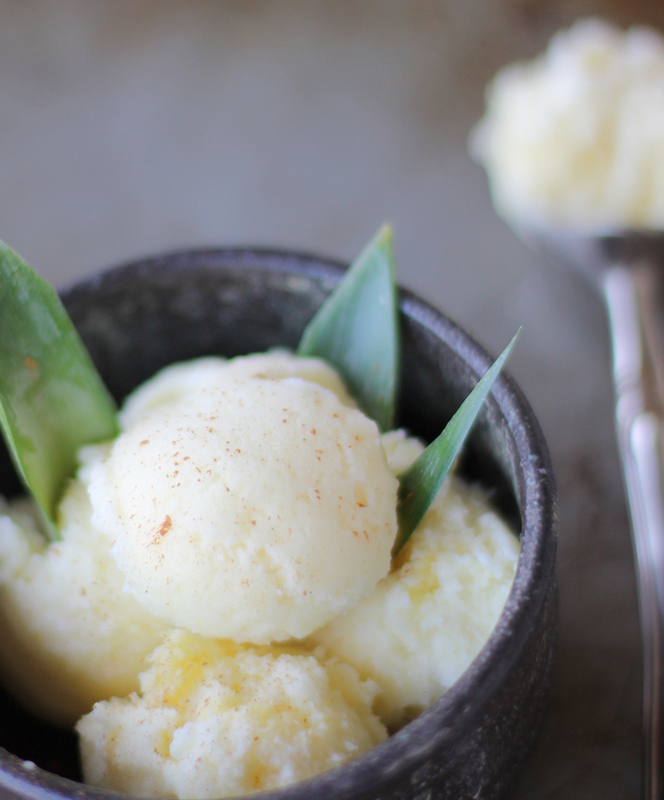 The result: A soft, light and delicious sorbet! ENJOY !!! Mix one cup of sugar with one cup of water and a teaspoon of vanilla in a saucepan until sugar is diluted over medium heat. 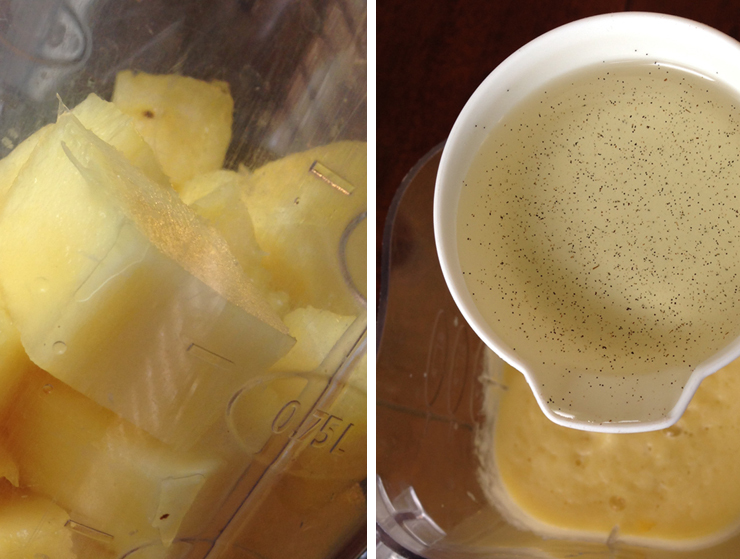 Blend the pineapple with half of the sugar mixture, then add the rest until it is all liquid. Add 1 or 2 teaspoons of vodka, to prevent the sorbet from freezing completely, alcohol won’t freeze, so it gives you assurance that you will have a soft sorbet. BEWARE IF YOU USE TOO MUCH VODKA it will not freeze at all. 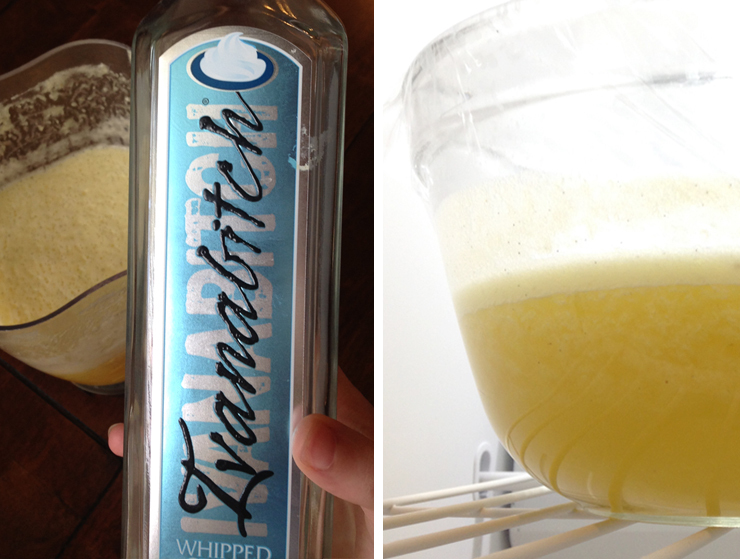 Freeze the mixture for about an hour. 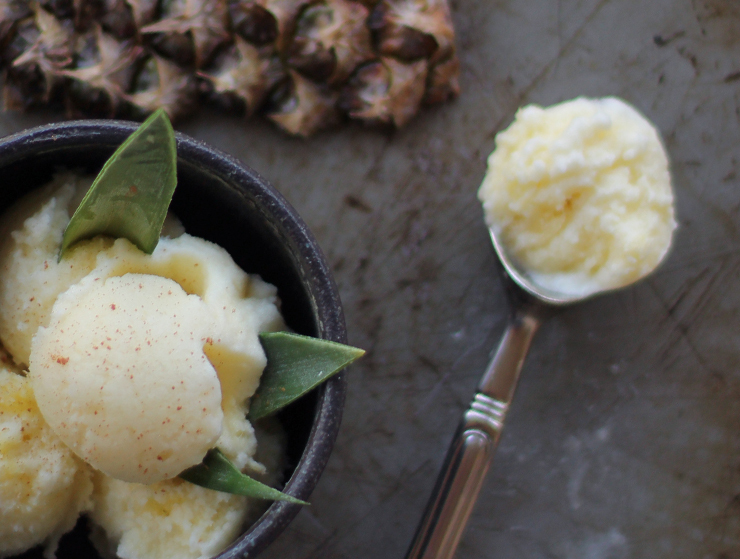 If you are not using an ice cream machine, mix the sorbet every hour until it is completely frozen. Sprinkle some ground cinnamon on top of the sorbet before serving.